Nocturnal Seascape, by Mike Jackobo. 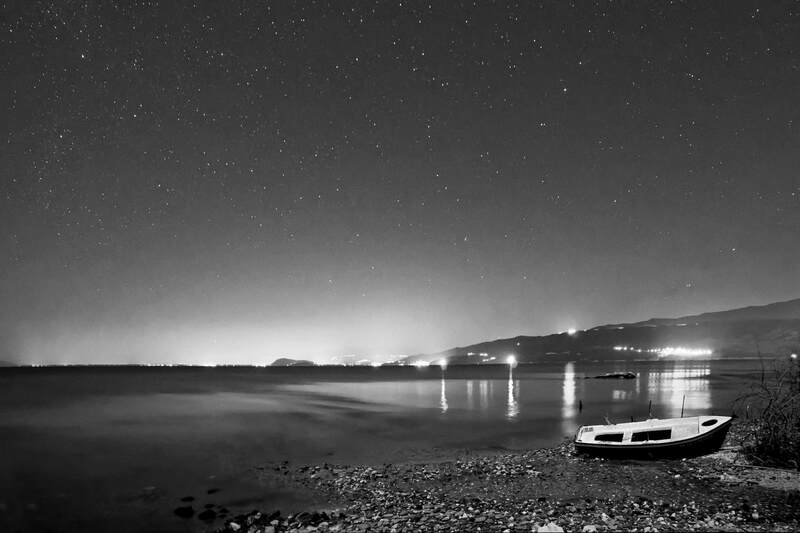 A boat is resting by the shore on a starlit night in this nocturnal seascape. About a year ago I became infatuated with astrophotography. There is certainly magic in the night sky. Especially for us who live in cities, where the sky is mostly a dark blue backdrop to the city lights. Every chance to be under the starlit sky, is a special occasion and I try to make the most out of it. I want to explore the deep sky objects (nebulae, galaxies, etc.). That requires a lot of carefully planned sessions though, because even the half moon is a major problem, so it is a bit difficult. The moon can provide light for nocturnal landscapes though. It is surprising how many details can be recorded by the camera, even under a crescent moon. This makes every outing into the darkness, a worthwhile experience. In this case, my primary goal was to capture the visible pass of the International Space Station through the winter constellations. An ISS pass can last from some seconds to five minutes in rare occasions. This amount of time is very short so, after making the photos I wanted, I began searching for more subjects. I didn’t have to search for long though, because my next subject was right to my back. The boat was in the perfect position for me to make a photo with the lights behind it and the starry sky as the background. The northern part of the night sky didn’t have any known constellations at that time of the year. What I wanted was the presence of the stars so, this wasn’t a problem. All I had to do was to find the right composition and I left the location with a couple of good photos. All I had to do in post-processing, was to straighten the reflections of the lights in the water. This nocturnal seascape is the result I came up with.